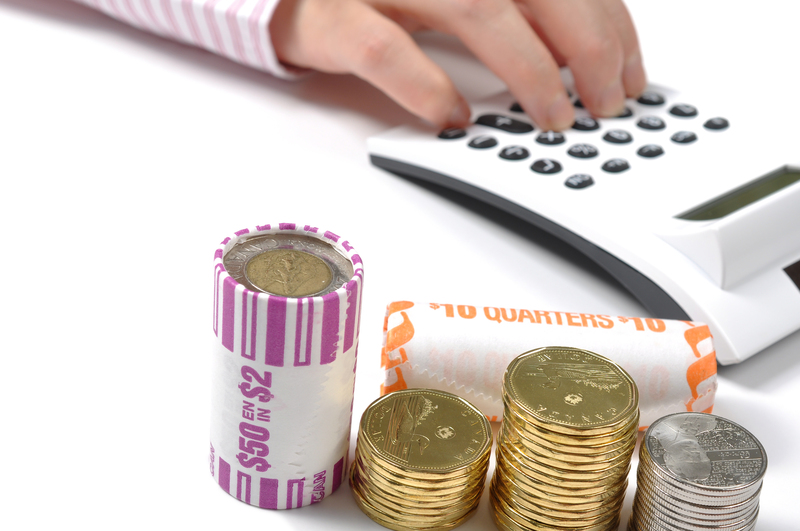 Canadian statutory deduction amounts such as credit thresholds and tax rates change every year. Every payroll clerk knows that staying up-to-date with these changes is required for accurate reporting and withholding. Not staying up-to-date with these changes not only creates more work for your payroll team to correct after the facts, but opens your company to the possibility of legal action. Under the Employments Standards Code, you could face grievance filings and possible court action from your employees. If the CRA finds that you’re deducting the wrong amounts, you will be fined. It could be as late as when you file your T4s that they catch it, which means you would have a year’s worth of mistakes, totals, and amounts you have to fix. In this post, we will cover federal changes as well as provide information on where you can find more information on these changes as well as provincial ones. You can click on any of the tables below to make them bigger. If you would like more information about income tax deduction in Canada, you can view our previous post here. 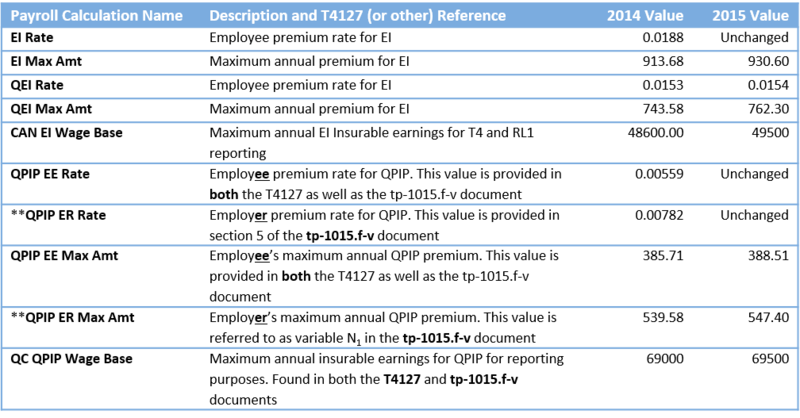 Every year the CRA publishes a new copy of the T4127 where all of the new payroll changes are announced. The version for 2015 can be found here. Revenu Quebec publishes their equivalent to the T4127 every year called the tp-101.f-v. The version for 2015 can be found here. The T4127 and the tp-101.f-v contain all the details needed for updating most of the statutory deduction variables. Updates to both CPP and QPP variables can always be found at the beginning of the T4127 as well as under the section for each program in the table of contents. The EI calculation rates and maximum contribution amounts are different in Quebec, so you will see both the EI and Quebec EI (QEI) variables in the T4127. Although Quebec has a separate QEI rate and maximum amount, the QEI is still part of the federal EI program. As a result, there is only one CAN EI Wage Base calculation and not a separate wage base for Quebec. The QPIP Employer premium rate (“QPIP ER Rate”) and the QPIP Employer’s maximum annual premium (“QPIP ER Max Amt”) values can be found in the tp-101.f-v. They aren’t not listed in the T4127. 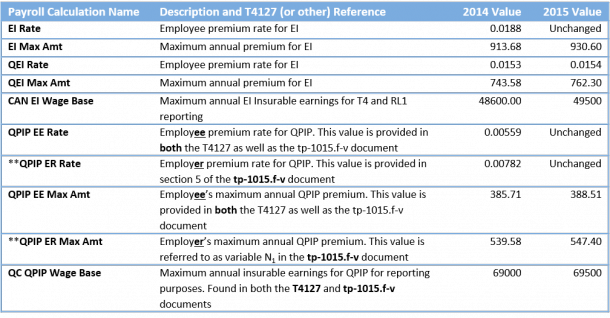 Each calculation rate item represents a specific claim code in the charts in the T4127 guide. Only the Item amount and Item rates are used. The “Item amount” is the minimum total claim amount on an employee’s TD1 form needed to receive the corresponding “Item rate”. “Item rate” is the tax credit amount. The “Item amount” correlates to the smallest value in the “Total claim amount ($)” column in the T4127 while the “Item rate” relates to the “Option 1, TC/TCP” column in the T4127. The only exception is code 1. As this is the base amount that everyone who is being paid for work will receive, this code does not have a minimum and maximum range like codes 2 to 10 do. Note: In the T4127, the “Option 1, K1 = ($)” for the Federal claim codes is the total claim amount found in the previous column multiplied by the lowest tax rate in the jurisdiction. “Option 1, K1 = ($)” is the actual total amount of tax claim an employee has. The provincial TD1 amounts and updates can be found in the T4127 as well. Below we have summarized the changes in each jurisdiction of their claim code 1 “Item amount” with their calculation variable. It is important to note that in the following calculation variable changes table, all item rates and rate counters are not used. Also the basic personal tax credit for Quebec can be found in the tp-101.f-v and is referred to as variable E, the value of personal tax credits. When lump sum payments (bonuses, retroactive earnings, retiring allowances, etc.) are paid out to employees, the payment is taxed at a marginal rate that is a combined Federal and Provincial/Territorial lump sum tax rate. The combined rates and thresholds for flat rate withholding on lump sum payments can be found here on the CRA website, but not on the T4127. 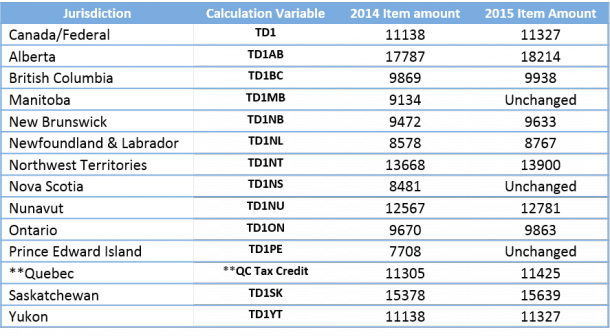 The “2014 item amounts” relates to the withholding rate percentage and the “2014 Item rates” refers to the maximum lump sum payment amount that the corresponding rate can be used on. Looking for a simpler way to manage payroll variable updates? With LOKI Systems, we issue all statutory income deduction changes in a spreadsheet for easy import into Advanced Payroll AX. We also include some deductions that are not statutory such as for workers compensation, the maximum eligible earnings, lump sum withholding rates, and any changes related to garnishment withholding. Fill out the contact form here and let us help you make staying on top of regulatory changes easier!